Showing 82 of 170 VWO ratings and reviews. User Review: "VWO is an easy to use platform for CRO"
VWO Is being utilized to learn more about and improve conversion opportunities across multiple products including client sites. The VWO platform quickly enables the ability to implement and test different hypothesis for conversion rate optimization goals. This includes enabling the ability to run simultaneous tests across multiple different mobile device types. VWO has a strong support team willing to help provide answers to questions during the setup process. During setup, we had some questions regarding implementation across a significant number of sites and they were able to ease dev team concerns and provide detailed best practices to streamline integration. Some of the initial results of a few of the initial tests raised some questions internally. We setup a call and were able to quickly address the questions and find some opportunities to leverage moving forward. I discovered a bug within the UI that lead to some questions internally. I was able to report it and the problem was fixed rather quickly and their team followed up with a thank you for reporting it and to report the issue was now resolved. The plans are constantly changing from a pricing and visitor perspective. This means that if you are trying to prove the product you will need to be ready for a long term commitment. This platform tends to consume a large visitor allotment to find a result. In our initial tests, it took much longer than anticipated in order to find a reliable result. If you pause a campaign or test, the UI creates a large red warning that indicates it has been paused. This notification is red with an large exclamation point that makes it appear as if something is wrong with the test. This notification is by design according to VWO cannot be dismissed. This creates some confusion when presenting or training new users. VWO makes implementation and integration easy. They have done a great job to ensure the script does not heavily impact load times or page speeds. This was a very important aspect especially if you will be doing tests across multiple sites or products. Overall the UI is easy to learn and the support team is quick to address specific questions. VWO Review: "Great user insight and conversion optimization tool"
VWO is used within our digital department to run A/B tests and to personalise our website for visitor segments. I personally also find it useful to watch recordings of visitors that have dropped out of our ecommerce funnel. VWO makes it easy to select these recordings, instead of having to manually go through a great number of irrelevant recordings. When designing A/B variations I can choose to either use the visual editor or to make the changes using code. I particularly like using jQuery. VWO offers the ability to keep long term track of the performance of your goals. I can easily identify recordings of users that dropped out of a funnel and watch those. There is live chat to get support, with great response times and which is very helpful. You are forced to create observations and hypotheses when creating a test, which is a great way to make sure that you are actually testing something worthwhile. You can group tests together so that you can rule out interaction effects between tests that you are running at the same time. The heatmaps within A/B tests are overlayed on the live website. Unfortunately, these don't work properly when scrolling down the site. I am missing an overview of all my custom conversions. I can only see a list of frequently used goals while setting up an A/B test, which may or may not include all custom conversions. It is well suited for exactly what you would expect. To gain insight into what visitors are doing on your website and to improve your website based on these insights through testing. Given my experience so far, I would say it is less suited to deal with websites that use AJAX. The insight gathering tools are still valuable, but the testing tools quickly become complicated. Review: "Overall, VWO has helped dig into user needs, and help direct business decisions"
We use VWO in my department to track website engagement, get feedback from surveys, and test different variations of enhancements and changes. We share this information with our marketing department, and sometimes the company as a whole. VWO A/B tests are easy to set up. I like that we can input our own HTML/CSS/js. Surveys are nice. I like the new feature of being able to see some recordings of sessions who answered the survey. Overall, the recordings are very useful. We have set up some recordings to even verify/debug some issues we were seeing on our site. Setting up specific goals or events is sometimes hard. our goals/events/clicks are not always straight forward as "if user clicks this thing" which means we have to do extra set up. Form tracking has been a pain, especially with forms that don't have a "submit" button - our checkout process. being able to funnel from delivery/pickup, delivery address form, to payment type, payment form, and submit, it has been difficult. we have dynamic forms with unique id per each session, which also required extra set up. We had an issue with the form only capturing the latest submit, rather than all submits. Even with it set up, the form tracking doesn't seem to capture how we would want. It's good for basic testing and tracking page engagement. If you have a complex site or are trying to use it as an analytic platform, it may not work as you would like. VWO was used within our digital team primary by myself and the developers, mainly for user research, collecting and analyzing the user feedback within surveys. The other main functionality we used was for MVT and AB testing throughout our UK website. With detail, reporting was helpful for board meetings and quickly grabbing data for presentations. Great customer service and support. Easy to use testing tool. Clear and simple reporting of stats/data. There is a lot to the tool that can add confusion. Lots of guides that sometimes are confusing too. Although there's great service, sometimes you are dealing with different people about one issue. Might be the time difference. VWO is a great testing platform. We found it straightforward to set up and implement throughout the whole functionality of VWOs testing. The tool is well laid out and should there be any confusion, there are plenty of helpful prompts, an editor which really anyone can use and the reporting is again very clear and easy to understand. Where it is less appropriate is when traffic levels are low, however, this would apply to many other testing tools. VWO Review: "Much better than Google Optimize!" VWO is being used within the marketing team to help improve on-site user-experience, increasing brand advocacy, and helping to deliver continual conversion rate improvements for our lead generation campaigns. Simple to create very detailed multivariant tests. Good heatmapping and scroll depth software. Easy to understand results and reporting. Easier to use form testing tools. Very easy to view the performance of the full funnel, identifying areas for improvement, and then theorizing and testing an improved part of that process. User Review: "VWO is a great fit for our company!" We use VWO for marketing, and particularly A/B Testing! We A/B test our paid landing pages and website pages. From content to hero images to CTAs, VWO helps us A/B test everything we need to understand how users are using and converting on our websites. VWO is also seamless in allowing us to manage four websites in one account. Easy step-by-step instructions to set up your tests. Easy to collaborate on tests other people on your team may have set up. We would like the option to not add a hypothesis, as sometimes our tests aren't developed enough for one. Date range on data reports. Our generic A/B tests for copy, hero images, and CTA copy/color/size/shape are all super well-suited for VWO. Our company has yet to come across a scenario where VWO has not worked for us. We've also taken advantage of the screen recording/heatmap sessions on VWO to make changes to pages, like our pricing page, once we know what may be confusing to a user in a new layout. 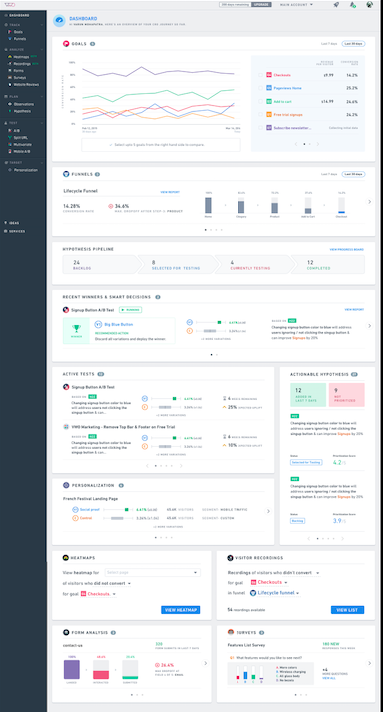 Review: "VWO -- Great for small companies and teams"
We use it for A/B Testing, Customer recordings, Heatmaps, reducing page load times, and making decisions. We find that we can show through their data why a customer will or won't behave a certain way. This allows us to stop making business decisions off of hunches and start taking action based on data that will move the needle for us and provide an overall better customer experience. That has translated to better sales for us. Customer Recordings. Take a page, watch how your customers behave, and start making tests to reduce friction. Heat Maps. We have long, evergreen content posts and we want to see how many people identify with the content, because then they will continue to scroll further on the page. A/B Testing. If you have a simple website built on basic code, you should not have to integrate or bring on a developer. It's an easy drag-and-drop functionality. You can also request hours to have them help you if your IT resources are limited. I think the UI could be a little more modern. At times, it can be touchy. I would like it to be easier to export a customer recording into a small MP4 file. It's not the easiest way currently to export. I think most of the company is based in India, which I don't have a problem with, but the time zones can make things a little challenging. 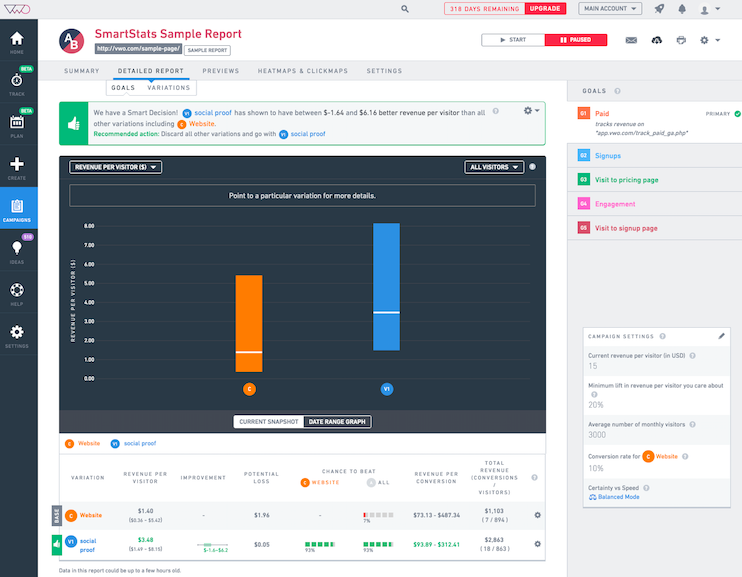 I would say it is well suited for A/B Testing, Customer Surveys (think popup surveys), monitoring customers, identifying customer behaviors, and drag-and-drop functionality for limited IT Resource companies. It is less appropriate for complete overhauls of websites. It would be best to do testing for a page at a time. You can do split URL testing, but it doesn't seem easy and would require some hours on their part. VWO Review: "Useful for simple changes, but developers needed for complex tests"
VWO is used by the UX & CRO department of our digital marketing agency to facilitate running A/B tests on client websites. It solves the business problem of not needing to much developer resource to run tests, allowing our team members to mostly set up tests themselves rather than needing complex code. Quick to set up AB tests on sites, with multiple variations allowed and the ability to use segments to control who sees the test. Setting up multivariate tests can be very difficult, particularly if you want to test something which requires custom code rather than using the VWO editor. Using the VWO editor to create tests can create excessive amounts of code to do quite simple changes, compared to if custom code written by a developer was used. The heatmaps could be more detailed, and seeing how far users had scrolled would be useful. VWO is useful when you need to run AB tests on websites which have been set up well. Problems can arise when the tests are more complicated, especially multivariate tests, or when the website is quite old/doesn't function as well as it should. Then tests can become quite buggy. It can also be difficult previewing tests via the preview tool, as that sometimes doesn't display the test correctly. It is also difficult allowing clients to preview live tests when there is more than one variation. The test can be set live to the client's IP, but to guarantee them seeing a specific variation it has to be set to 100%, so you can only show one variation at a time. "Just an honest review about VWO"
It is currently being used by CRO and UX department, it's main focus is to AB test. Horrible usability - the navigation within each account is quite something, not clear where you find certain features, imagine someone using it daily and having to deal with these issues - it's really a perfect recipe to ruin anyone's day. The reporting isn't great either, it's difficult to understand how VWO reports as it never matches up with data in other platforms i.e. GA.
Another issue is related to the glitches and bug fixing, sometimes VWO agents don't have an answer and it can be frustrating. Site speed - it can negatively affect the website and user experience, however not much has been done about it over the last few years. MVT testing is too complex and in many ways impossible to actually execute. It's well suited for the AB testing simple tests, which tie in nicely within the CRO strategy. Not ideal for personalisation and wanting to do tests which are more sophisticated. VWO Review: "A good enterprise web analysis package"
It's being used to analyze our marketing and e-commerce site. We use A/B testing, recordings, heatmaps and surveys to gather information about how users are able to use our sites and what they are understanding. A/B testing has been valuable in getting buy-in from decision makers as we are able to directly prove the effectiveness of the changes we are proposing. Visual editor for A/B testing is really solid, especially if your site is fairly static. It gets a bit tougher when you have very dynamic content but it's still much easier than having our dev team make two versions of a page and try and split traffic. Recordings and Heatmaps are invaluable assets for figuring out how well certain pages are working. While they don't replace standard user testing they can supplement it very well and reinforce your position to make a design change. Support has been fairly quick to resolve rather complex issues, even with a bit of a language barrier a lot of the time. Discussing technical challenges over chat is not easy but I can usually get these difficult challenges ironed out in a day or so. I don't really use the "plan" features much. They seemed nice at first but they are too slow and cumbersome to use in practicality. I don't like being forced to use it to do testing. Goal tracking seems limited. I'd love to be able to use advanced e-commerce goals (like how many people bought a specific product) for my test but have to use overall revenue and 3rd party tracking like GA to fill in the gaps. Dynamic content is really hard to edit. Anything built on a modern JS framework is hard because manipulating multiple states on the same page starts to get really complex. There's a lot of workarounds, and I haven't found a better solution, but it's not as easy as point and click if you have something more complex than a static site. I wouldn't recommend VWO to non-enterprise users. Hotjar does a lot of the tracking equally as well at a fraction of the cost and there are split testing options out there that are much, much cheaper. It's convenient if you have the budget to have it all in one place, but if you don't, then doing it on two different platforms is still workable. If I'm price sensitive I'd probably explore some other options in combination with Hotjar. Review: "VWO: The tool you never knew you needed." We use VWO primarily for its A/B testing functionality, secondarily for its ability to edit website content on the fly and implement flexible customer experience surveys. We use VWO in our EBSCO Mags business line, a B2B magazine agent. It allows us to implement A/B tests based on user behavior and other criteria and it allows the marketing department to make changes to the website before the Web Development team is able to implement permanent changes. A/B testing. VWO users are able to use all sorts of criteria to trigger and serve an A/B test, and the editor functionality is extremely flexible in editing page content. Surveys. We're looking to expand our surveys with the new logic functionality that VWO is beta testing. Web content editing that circumvents the web development "wait time". If marketing needs something simple changed on a webpage, all we have to do is go in VWO and edit or hide it. Continued learning. I think that quarterly product update calls would help us understand what's new in the VWO universe. VWO is great if you're looking to learn more about your customers' online behavior, even if you've never had any kind of formal A/B website testing plan. VWO Review: "Recommended for websites with high volume traffic"
We use VWO across two markets. It helps us extend a test beyond the fundamental of AB Test. It has a 360-degree view of funnel and goal. Each test can be customized depending on traffic volume and specific to its conversion rate. As no pages value are equal, it makes sense to adjust conversion or improvements as you'd expect. It solves the issue of a number of concurrent tests you can run on the case of Google Optimise. Solves some flicker issues and nuances you get from using free testing tools. Tool also helps us from hypothesis to agile recording of insights and conversions to implementation, reporting and insights. 360 degree view of your tests helps you frame insights. It's always challenging to put together reports if you're using multiple testing tools. I like the collection of hypothesis and problems to solve, and you can reuse them to other tests rather than starting from scratch. The best thing is that it's simple to use. Features are arranged in a simple and easy to understand manner. Form tracking is one of its features that I really like. However, our websites are using Angular forms and it needs a bit of customization from their support. For us the volume of traffic is not yet that huge, I had to spend quite a bit of time to calculate what should be the right conversion rate to achieve. Would be great to also cater for low volume traffic in running tests. Definitely better for high volume traffic. And probably not ideal for low volume traffic. VWO Review: "A great suite of UX tools to understand your users and test ideas"
We use VWO within our digital design team to conduct on-site surveys, observe how users interact with our site, and perform A/B tests, all with the aim of improving the usability of our site. On-site surveys allow us to gather information directly from our users without having to seek them out and ask in person. For example, what information they would find useful for specific pages. Recordings of users allow us to see exactly how people use our website, so we have a greater idea of where improvements can be made. A/B tests give us vital information on if an idea really does work or not. As a UX designer myself, I appreciate how well VWO has been designed. It really is easy to use, especially for something complex like creating A/B tests. Our front-end team has a huge issue with how long VWO takes to load, which obviously will have a negative impact on user experience. More needs to be done to reduce this issue. VWO is great for gaining a better understanding of your users and testing ideas to know if they work. Heatmaps, surveys, session recordings, hypothesis, and A/B tests make a complete set of tools to figure out what people are struggling with/need, and to analyze and test what will help make your service/product better. Review: "VWO: Easy to realize big improvements on your website"
VWO is being used by our marketing department for optimizing our website. We will have a look at the heat maps to see what people click on and think is most useful. And we use A/B tests for continuous optimization of our homepage and landing pages. We try to answer questions like: how can we best serve our (potential) customers on our website? Last time I wanted to add a B-variant in a A/B-test on our homepage. I changed the existing content (that was separated in two columns), but in the preview it kept showing elements I already deleted. In the end I decided to skip this test, because I couldn't find a solution. Integration of Google Analytics can be more easy, so I can easily use my existing measurement goals for example. Exporting of the made heat maps into images. VWO can be used well if you want to see how your website is used. Where do people click on the page? How can we optimize our conversion path? And you can easily test your improvements on part of the visitors, so it won't have too much impact on your running business. If you use an iframe, in our case it will not be tracked. Probably if you add the VWO code in the iframe, but it is something you should be aware of. User Review: "VWO: An All-in-one CRO platform"
We use it to run A/B tests, surveys, form analysis, and web recordings. It is primarily being used by the product team and to a certain level by the marketing team. It helps us to analyze how users behave and respond to various pages. Apart from this, it helps us choose one variation over the other while running experiments at any scale. Conducting A/B tests. Segmenting their reports to get deep insights into which variation is performing well for what segment of users. Form analysis. Knowing how users are interacting with the survey. Surveys. Conducting various levels of surveys via the platform. Connecting it with other tools like CRM, GA, etc. Running multiple experiments on the same page simultaneously. Running A/B, split URL tests easily without having to worry about any setup process. Connecting them with GA for advanced analytics could be done in a better way. It is also a great tool for conducting surveys and doing form analysis on a bunch of different landing pages. They have great customer support as well. "VWO Review from agency perspective"
VWO is being used to analyze client's sites and improve their conversion rates. It addresses issues related to UX or poor conversion performance. We use this tool across a variety of templates and sites to gather insights on user journeys and flows. Hard to build tests when dealing with dynamic content. The WYSIWYG can be confusing as most tests require development. It would be good to have an easier integration with Google Analytics. It can be quite tricky to implement tests when you don't know JS. In my organization, we manage the UX and CRO on our client's websites and use VWO to give us the ability to AB test on the sites. It only gets used by the UX and CRO team, and not in other departments. Mainly it helps us by giving us the ability to test the impact of making changes on websites, so we can build the changes in house and direct traffic to the appropriate percentage of users, with less time required for the clients. Ability to direct test traffic to specific user types, devices, IP addresses allows easier test previewing and allows you to direct relevant traffic to the tests. It is easy to set up new sub-accounts and sub-users so relevant people can view relevant accounts. Ability to send preview links and QR codes of test variations. The idea of having heatmaps with test variations are great. However, I find the VWO heatmaps largely unreliable, and don't show much data. The previews links are really important so we can send our tests to clients before setting them live. However, they are really unreliable and are quite difficult for clients to use. You have to ensure the client clears their cookies and views the test in incognito, which is fine, but even after doing this it does not always work. Building tests can be quite awkward as the code editors are overlaid over the view of the page, so you can't instantly see what the changes to the code do to the page -- you have to close the code editor, then select to correct variation. If you then find something isn't right, you find yourself repeating this a lot. This is a great tool to use if you are wanting to change something on your site, but want to make sure it is the best thing to do for the user. You can use this tool to track user conversion and engagement on the website to track the success of the changes you are made. Although, if the changes are quite large on the page/site, it may not be appropriate to do this on VWO, as it can break and cause more issues on your site. For instance, major changes to the page, such as new navigation, may be too big for VWO. This is being used only by the e-commerce department. We use them for on-site A/B testing. We use the tool to learn more about our customers, their behavior, and how to improve the overall site experience. We have leveraged this data to share with our retail partners. There are a few tests we can run based on branding, but are also able to test based on behavior, which is great. They come up with great ideas on their own. They try to push their ideas on you instead of learning your brand. Time zone differences (based in India) make it difficult at times. They were able to unlock a few issues our customers were having on site, which lead to great CVR increases. However, they can be a bit pushy about what they want to test at times, leading to frustrating conversations. They have a great pricing structure, which makes things more tolerable. User Review: "VWO is doing well for us." We are using VWO in the e-commerce department, together with an external consulting agency. We got some great insights and could fix some issues by watching the VWO's recordings. It's great that A/B tests can be paused and changed. In Google Optimize, we were struggling when we needed to add some minor changes while a test was running. We love Smart Decisions. It's a time saver and helps whenever we aren't sure if should keep a test running or not. VWO is a great testing platform. There are several functions within one software. We were able to get rid of several tools that we used before. We have them all in one place now with VWO. Our company has several online products which are operated by different teams. Members of these teams who are responsible for product development (we simply call them our customers) along with our UX team come to our department with their ideas and tweaks on how to enhance their product and then we discuss together what should be A/B tested before they would go into any kind of development. After a test has finished we evaluate the results together and decide upon them whether to apply the tested changes or not. Visitor segmentation. There is a good amount of metrics that can be used to target those visitors you desire. Estimation service. The provided results sometimes look strange. It is hard to figure out if the estimated run-time of a test is a result of a buggy calculation or you simply put in the wrong numbers for calculation. We like to use VWO for testing smaller changes which don't necessarily require coding skills as it can speed up the creation and execution of our tests. VWO Review: "Good features, some bugs, suffered from lack of adoption in our organization"
We have a unique organization where we have a central services team that assists 4 publishing groups. We implemented VWO for use in all teams. We are a direct response marketing company and wanted to leverage VWO for format testing across our promotional pages and order forms, as well as our fulfillment websites. The real value would have been to optimize our sales funnels using the tool. Multivariant testing async. We have a limited development staff, so having our marketers be able to control experiments was a big plus. Multiple dimensions for testing, allowing us to isolate tests based on device was a benefit. Screen recordings, being able to view customer recordings was valuable to see what people are doing on our pages. Heatmaps loaded very slow. We have very long form sales copy and VWO could not load the pages with a heatmap view a majority of the time. Google and Facebook slap. We were shutdown from running ads to pages that had VWO embedded in them as it was perceived as cloaking. This was the biggest issue for us as we rely on optimizing for display spend. It is well suited for user experience and optimizing UI on a traditional website. It is not well suited when you need to optimize on campaigns from display as you run the risk of the native display networks blocking your ads from running. VWO Review: "Solid Testing Platform"
2) Draft new hypothesis to fuel next rounds of tests. A/B & Split testing tools are being used by the Development Team to set up and execute tests on our Shopify stores. Test set up is a breeze and settings are presented in a thought out sequence. Recordings, Heatmaps, and other observation tools are easily segmented by audiences we care about, making observation simple for our UX team. Our customer success manager is always available for meetings and proactive in his advocation for the platform. Observations currently (9/14/18) don't support outside domains. Observation collection sample rate is a little low (for the price) - takes a bit longer to collect meaningful amount of data. For sites with backend languages (i.e. PHP) it is simple to do A/B and split testing as we can rely on parameters set, which can be analyzed by PHP before page loads. User Review: "VWO, The Complete Package." VWO is used to help improve our web store products. As a SaaS company recently leaving the start-up world, we wanted to be scientific about the performance of our customer's web stores. VWO allows us to measure multiple domains and aggregate the data to get a better picture of average performance. We have several hundred stores spanning 40 brands, so in order to properly diagnose conversion rate performance, we decided to create a small group (like the S&P 500), and measure them. VWO helps us optimize conversion rates. Goal Measurement. I enjoy the different objects you can target, and how easy they are to set up. Specifically, targeting elements and measuring their usage. Survey Data. The survey data is very interesting. I do wish you could make the parameters for showing a survey more complex, but it works very well as is. A/B Testing. I much preferred the UI layout of these screens over Google Optimize. It's easy to set markers utilizing goals and visualize the performance of variations. A/B Testing Goals. Sometimes when I conduct an A/B test, I want to measure a goal I'm already tracking. However; I can't see these goals from the Test set up screen, so I end up having to recreate them. You might consider a method for adding them similar to the way funnels are built. The documentation and integration with GA is under-stressed. GA is a staple for all web companies, so I might suggest working to integrate this better and bring it to the forefront. There are some measurements that are difficult to accomplish with VWO, such as conversion tracking or bounce rate. I ran into constant problems distinguishing between https:// and http:// . I actually ended up just using "contains" with the url, which was less than ideal. I might suggest a better way to clarify this -OR- a setting that will accept either. VWO is great for funnel analysis, multiple domains, surveys and A/B testing of any kind. I really enjoy the way that you can build custom segments to separate groups of domains. This is useful if you're working with aggregate data like we are and you want to make a comparison. Surveys are easy to integrate, and their triggering can be customized sufficiently. A/B testing is a breeze, but I believe this has been mastered across other platforms as well. User Review: "Extra credits for VWO platform"
All in one platform: The fact that Visual Website Optimizer offers all the features available in one platform facilitates the research work of marketers a lot. A/B Test feature: Within the A/B test feature, users have the possibility to analyze the results not just on a summary level, but on a detailed one, too. The best part always comes from the detailed report, which offers a clearer view of the performance of the test. Support team: Visual Website Optimizer has a great support team for their users. Fast, knowledgeable, friendly people that you can lay your trust in them that by the end of the day (if not quicker,) they will be there with a solution for you. The support team can assist you in any difficulty you might face at that specific moment with clear directions, both by email or a call. Surveys are a great way to get insights from your website visitors. The current version offers you the possibility to do so, but in a very basic way: question -> answer -> the end. My recommendation would be to upgrade this feature by adding branching logic to each answer. Customers of Visual Website Optimizer can allocate visitors to their sub-accounts by designating 'testing visitors' or 'research visitors'. Both of them are equally distributed among the different features. But my recommendation would be to have the option to allocate visitors from the 'research visitors', for example, by each individual feature. To know from the start that 100% of research visitors will be distributed depending your needs. e.g. 25% recordings + 25 heatmaps + 30% surveys + 5% forms + 15% Track features. It would be great if the Heatmap feature would have the option to save the created reports in a PDF form. This will allow any additional user of the VWO account to overview them on a later point. It is a great way to start testing and showing the results of conversion optimization efforts. It is priced right and has the right features to improve client ROI on websites and display/paid search landing pages. VWO Review: "The best and most cost-effective alternative to Optimizely"
We use Visual Website Optimizer (VWO) as our primary A/B testing platform of choice as it has an easy to use interface, does not provide extra load on a client's website (it loads async), and has all the basic features to run an effective optimization program. Most importantly, it seems to be the most cost-effective alternative to Optimizely. Automatically creates heatmaps of test variations, so no extra "syncing" work is needed to be done with Hotjar or other tools. Easy to use interface that let's you quickly create, develop, implement, and start A/B tests. A/B test analysis is not great. Instead of giving you a specific number on lift, it gives you a range and calculates "likeliness to beat control". This is due to the fact they use Bayesian statistics and not Frequentist. Though I don't think they need to move away from B Statistics, having a specific numbered lift, like X% better/worse, would be extremely helpful in communicating the effect a test has to clients. No easy way to see how long a test has been running. Must look at the date range on a different view in analysis and then count the days. Very annoying since it could easily be solved by just listing the duration in days somewhere. Cannot compare conversion rates over time. Optimizely and most other AB testing platforms create a nice chart that shows how the conversion rates of different variations have changed in relation to each other overtime. VWO does not. Instead it gives you a line chart of the amount of conversions per variation over time. So naturally the line chart just keeps growing because conversions keep coming in. But comparing amount of conversions is very misleading since its conversion rate we care about. If a client has a large budget and would like "best in class", Optimizely is hands down the way to go. However, with a smaller budget, VWO in my opinion is the next best option as other platforms fall short. VWO is an A/B testing and conversion optimization platform that enables growing businesses to conduct qualitative and quantitative visitor research, build an experimentation roadmap and run continuous experiments on their digital properties. With its 5 capabilities Plan, Track, Test, Analyze, and Target, it brings the entire CRO (conversion rate optimization) process at one place. VWO helps online businesses follow the process- and data-driven conversion optimization to boost their conversion rates. With features like heatmaps, surveys, visitor recordings, and others, VWO enables businesses to develop an in-depth understanding of on-site visitor behavior. VWO facilitates conducting research-driven A/B testing to optimize web experience across desktop, mobile, and other devices, to deliver a unique experience based on visitor preferences. According to the vendor, VWO has helped more than 4,500 brands across the globe to run over 600,000 experiments to date. VWO’s global customer base includes brands like Vodafone, Samsung, Toyota, and eBay.